If your company handles a lot of payments from your customers and managing their payments in-house is just too much to handle for your staff, you might want to consider a service from your bank called Lockbox Banking. According to Investopedia.com, Lockbox Banking establishes a special post office box as the designated payment destination. A bank staff member would be responsible for collecting, recording and processing the mailed-in payments as well as depositing them into your business’ bank account. Lockbox Banking provides a timely, efficient and cost-saving way of handling payments from your customers, affording you greater control of your money flow, but it also opens you up to potential fraud if bank personnel are untrustworthy. Having access to your lockbox means having access to your client’s checks, and a dishonest bank staff member could easily counterfeit their checking information. A three-prong defense — common sense, technology and the law — is the best plan for protecting your business’ important documentation online, according to Forbes.com Contributor Evangeline Gomez. Gomez explains that with advanced information systems, you can manage who can view specific documents and determine which documents can be accessed by a greater number or all of your staff. Be very strategic with who can see what and when. “It is vital … for any small business owner to make documents available on an as-needed basis to as few employees as possible and to keep clear records on which employee has accessed what documents,” Gomez reports. Your business’ game plan, trade secrets and formulas need to be protected immediately and continuously, and that’s why you should enlist the expertise of an attorney to draft confidentiality agreements, advises Gomez. Non-compete agreements with senior executives can add another level of protection around your business’ most crucial data. Although it might elicit groans from members of your staff, employing a two-step log-in can help protect your online assets, too, according to USA Today Writer Jolie Lee. She also advises that anti-virus programs are a must if you want vital information to be secure from thieves. 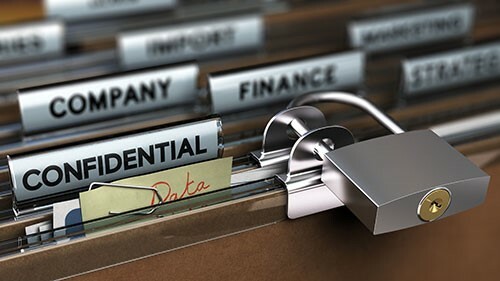 Chances are that a lot of your business documents have personally identifiable information — meaning they record social security numbers, account information, names, addresses and date of birth. Although one document won’t contain all that information, when gathered together your documents reveal everything about you and your clients. Thieves know this, and by rooting through your trash and recycling, they can compile the necessary data to steal your identity or assets and create new accounts in your name or in the name of one of your clients, explains Bankrate.com Writer Jennifer Lawler, who interviewed identity theft experts Robert Siciliano of BestIDTheftCompansy.com and Rob Douglas of IdentityTheft.info. Don’t make a thief’s job easy by handing over a hard copy of your business’ or clients’ identifying details. Instead of just tossing paperwork that has any identifiable information into your recycling bin or trash can, Lawler advises you shred it first. Your financial information and identifying details as well as your clients’ details are your business’ most critical resources. You need to protect them because the success of your business and, more importantly, the trust of your clients, depends on it.